This is an experiment. As I get deeper into 21st Century Skills, I absolutely embrace the concept that experimenting, tinkering is my best way to learn. It is my most effective way to learn. If I stay on the straight and narrow path, I learn the straight and narrow. If I step off the curve and test out ideas, experiment with the tools I have at hand, I learn far more, and sometimes, I like to think, I actually discover something brand new. Anyway, this is an experiment to see if a Wall Wisher board can be shared and used by others. If this works the wall below should continue to grow as the participants of the CCOW community contribute to it. We’ll see. I am learning how to use a MaKey MaKey circuit board in conjunction with Scratch to create simple music. These videos track my progress. Leah Buechley is my new rock star. Working in the MIT Media Lab, she is exploring ways we can combine electronics and computer programming with art, music, and fabrics. Leah is an assistant professor of Media Arts and Sciences at the MIT Media Lab, where she directs the High-Low Tech research group. For more video on the amazing work her group is exploring click here. How are we going to educate students to be prepared to live and work in a world where up-to-date encyclopedic information is as close as a smart phone click? Where new technologies are being developed at lightning speed? Where many jobs are being outsourced to countries where they can be accomplished at lower costs? And other jobs are being automated? Tony Wagner explores these questions in his book Creating Innovators – The Making of Young People Who Will Change the World. When I think about the path real life takes for most people, I think Dempsey has it just about right. You could promise that to anyone in any situation and be true to your promises. As all of these interviews were taking place, Robert Compton has his camera running. The book is full of QR codes which, when scanned with a QR scanner such as Tag Reader, will bring up the video so you can watch the interview. All of the interviews can be found at http://www.creatinginnovators.com. Whether or not you agree with Wagner, this book offers food for thought about how we should approach the education of today’s students. 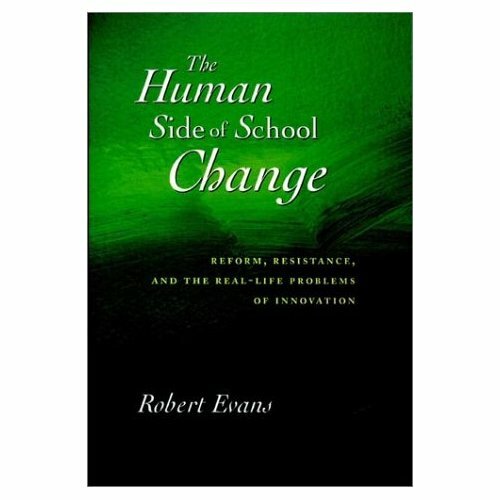 I’ve been reading Robert Evans’ book, The Human Side of School Change, and driving everybody crazy quoting what he has to say about trying to implement a change in philosophy and practice in a school setting. The most important message for me is the not-so-new idea that asking a teachers to change their beliefs or their methods challenges the very core of their identity as a teacher. Teachers do what they do in their classrooms because they have come to believe, through experience, that it is the right way to do it. They have seen the effects and the results of their methods first hand. Yet sometimes change is necessary to provide our students with the knowledge and skills they will need to be successful in a world that is different from the world as experienced by their teachers. My grandmother taught me how to make a killer pound cake – literally. Six eggs, three cups of sugar, three sticks of butter…. this is not a heart-friendly pound cake. But, oh, it melts in your mouth like no other cake can. When I make it, I try to do it just as she taught me because I know that’s what works. But I have to wonder if her grandmother or great-great-grandmother made it the same way. They certainly didn’t have the KitchenAid mixer or the Samsung oven I have. Did they beat the batter by hand? Was their oven heated by wood? Could I make the same cake that way today? Would I want to? Would they watch me do it my way and tell me that my cake is not the same as, not as good as theirs? Times change. Needs change. Some of the skills we taught our students in the past may not be relevant anymore. Yet that fact does not make it any easier for teachers to embrace change. I think this will be a topic I will revisit many times, trying to find the best ways to ease in new attitudes, new ideas, and new skills. Our students are waiting for us.